Super Castlevania IV (悪魔城ドラキュラ, Akumajō Dorakula?, lit. "Devil's Castle Dracula") is the 4th version of the first Castlevania, and the 8th game in the series; it is also the 6th Castlevania game released on a Nintendo consolle. In fact, the original Japanese title lacks any numbering. 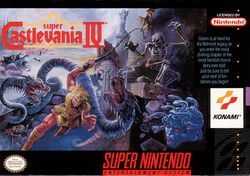 It was the first Castlevania to be released on the Super Nintendo, and is often considered to be a showcase of the the consolle's capabilities. The game was inteded to be a remake of the original Castlevania, however the level design, graphics, music, and gameplay have been completely overhauled. The world is much more expansive, taking place both inside the castle and in the surrounding countryside. "In the small country of Transylvania there is a legend which says that every 100 years the forces of Good mysteriously become weak and the forces of Evil gain a foothold into our world. The evil manifests itself in the form of one of the most feared characters to roam the earth: the vampire Dracula! Every 100 years Dracula is revived and grows stronger and stronger. His goal is to turn all humanity into creatures of darkness, to be ruled under his iron fist. He has appeared in this world many times, and there are many people who fear that in his next appearances, he may be unstoppable. Now, 100 years have passed since the last battle between Dracula and the Belmonts. Transylvanians are reporting mysterious sightings of odd creatures appearing under cover of the darkness. As Spring approaches, the citizens prepare for a traditional celebration. Unbeknownst to them, an evil group of people is holding a ceremony in the old destroyed abbey outside of town, attempting to revive the Prince of Darkness. As they carry out their ritual a dark cloud descends over the countryside. The sinister group stirs itself into a frenzy of mysterious chanting and pagan dancing, then lightning strikes the abbey. The ground bucks under their feet, and the abbey walls shudder. Once again, Dracula is revived! It is time once again for Simon Belmont to call forth the powers of good to aid him in his battle. Armed with his mystical whip, his courage and the centuries-old knowledge of Belmont family training, he sets forth on his mission..."
This page was last edited on 15 October 2018, at 07:28.